Goodman Real Estate Services Group combines experience, human and technological resources and enthusiastic hard work to offer our clients professional and thorough service and representation. We have grown since 1998 to be a Midwest market leader in commercial real estate services specializing in retail. Our resume is our references. Our track record is unequaled in pre-leasing for new developments, re-leasing, investment sales, and tenant & buyer services. Synergy of our properties, market knowledge, and relationships provides leverage. 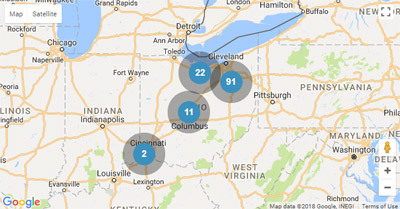 Market knowledge provides occupiers locations that succeed. Superior connections to buyers, sellers, landlords, and tenants, creates value. We are better because we invest in our 14 professional brokers more than any other company of which we know. Our technology is the latest and greatest. Our support staff is our most valuable resource – trained and empowered. See our accolades; call our references. Our results speak for us. Goodman Real Estate Services Group is the market leader in representing and directing companies in their real estate acquisition process. Whether leasing shopping center space, purchasing or leasing land, or build-to-suit development, Goodman Real Estate Services Group has the market knowledge and tools to uncover successful locations. Each broker is trained to advise as well as represent our clients through every phase of the site selection and deal negotiation process. Educate us and we will educate you. Immediate and long-range strategic planning starts with understanding our client’s business and their customer. Thorough market analysis, focusing on the demographic of the consumer identifies all potential trade areas. Mapping the maximum potential trade areas and comparative demographic analysis produces the market penetration plan and strategy. Communication of the plan is compiled with spreadsheets, maps, and other data In-depth analysis of competition, sales data, and other relevant factors is included with the plan and entered into the strategy. Site opportunities are communicated in spreadsheets with location data, aerial photographs and maps, and boundary surveys and site plans. The data contains the information to make decisions such as relevant market, traffic, sales, and competitive information. Multiple opportunities are created and negotiations commence and deals are completed. Thorough market knowledge is achieved by our continuous and active presence in the marketplace. We have developed positive relationships with owners, brokers, other business people, and governmental representatives built over years of extensive work in multiple communities. Goodman Real Estate Services is known for its long-term client relations. We maintain lasting associations by supporting the companies we represent regardless of the transaction quantity. Our objective is to adapt our services to our clients needs and be an extension of that company in our marketplace. Implementation of any real estate strategy utilizing our experience, technology, hard work, and comprehensive market knowledge provides our clients with quality service and results. Goodman Real Estate Services Group offers unparalleled national investment brokerage and advisory services, facilitating transactions and providing property and portfolio analysis for a full range of clients from institutional to private. Our focus is on the retail marketplace, and we have in-depth knowledge of all aspects of the national retail landscape that allows us add tremendous value for the clients we represent. Because we are a multifaceted retail brokerage with direct lines of communication with most national retailers, we are able to view investments and value creation from both single-property and portfolio perspectives much differently than the average investment brokerage. This integration of our national investment brokerage and advisory platform, along with one of the most knowledgeable tenant representation and property-level leasing teams in the country, allows us to provide our clients with a full spectrum of information regarding the asset(s) being evaluated. The result is reliable and accurate evaluation, pricing, and marketing strategies that remove the guesswork and provide an assurance of end-value maximization. We are passionate and dedicated to what we do and pride ourselves on working creatively, collaboratively, and tirelessly to assist our clients in reaching their goals. Marketing Services: We dominate the market in leasing and sales of retail properties. This scale provides synergy and leverage that directly benefits owners with results. Creating, protecting, or increasing value is the goal of all marketing campaigns. Leased properties are analyzed to create a plan for maximizing income which indicates the best tenants to occupy the property at the highest rates. Marketing directly to these tenant groups efficiently identifies prospects. For-sale assets are priced by market comparison and demand analysis that only market knowledge can provide. Aggressive direct marketing to specific buyer groups locates the highest-price buyer. Our development brokerage services range from identifying development sites to fully engaging in the development process. Services and value we provide include site planning and tenant mix, design input, parking impacts, pro forma economics, and municipal approval strategies and expert opinions. Our knowledge in negotiating rates, sales, and terms and on how tenants and buyers get deals approved creates value well beyond finding the interested party. Goodman Real Estate Services Group currently lists over 10 million square feet of existing shopping center space, surplus properties, and new developments plus acres of vacant land. Also, we have successfully pre-leased over 4 million square feet, supplying the deals needed to successfully develop numerous properties into power, community, and lifestyle shopping centers. The large-scale leasing and sale of multiple properties in various areas, combined with our tenant representation business, provides market and occupier knowledge that benefits all of our property marketing campaigns. Surplus Properties: Goodman Real Estate Services Group has developed lasting relationships with companies that must dispose of leased or owned assets. We understand that these transactions may not be based on typical industry circumstances. The assets or liabilities of a company don’t always simply get sold or leased. These deals often involve various financial, legal, or operational interests that must be considered and balanced with actual market conditions. Locating users and buyers and negotiating transactions start with our typical marketing services but is aided by our tenant representation business and perspective. Our experience representing the buyer’s side has given us the knowledge of the user we are looking for and with whom we will negotiate. Years of experience on all sides of transactions and involvement with many different businesses such as institutional clients, retailers, and private business owners provides our clients with professional surplus real estate disposition services.